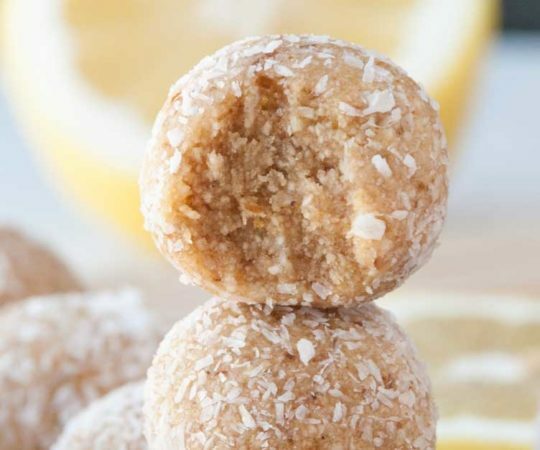 Since simple, raw energy bites have been some of the most popular recipes here on PaleoGrubs, I was excited to come up with another version of the recipe to share. 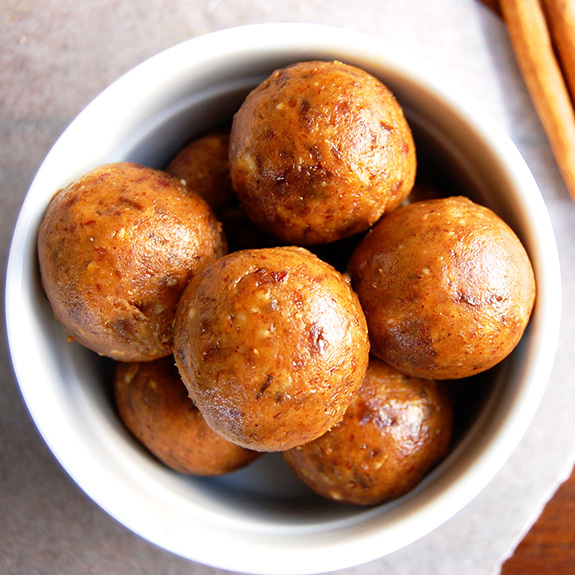 This time the delicious round bites include pumpkin, in the spirit of the fast-approaching fall. 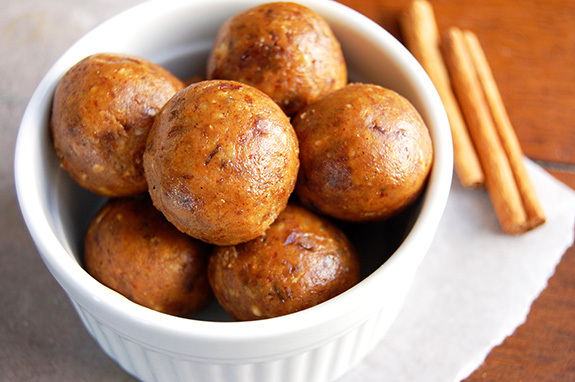 Ready to enjoy in minutes, these pumpkin pie energy bites make the perfect sweet snack. I have a habit of craving something sugary at the end of my meals. These small sweet bites are the perfect solution for such occurrences. Eating one or two for dessert satisfies my sweet cravings without any guilt, since they are also healthy for me. 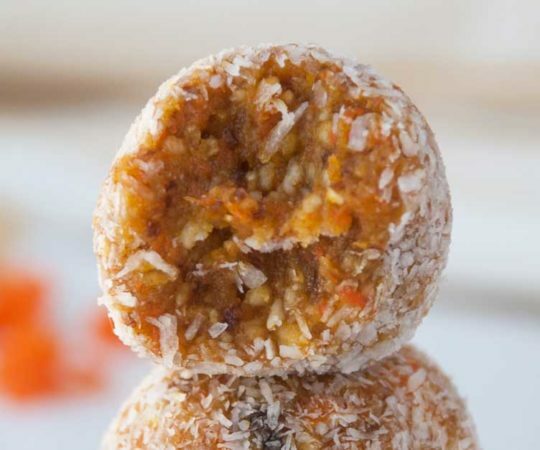 The right mixture of dates, pecans, pumpkin puree, and coconut flakes gives the balls an almost cookie dough-like texture as you bite into them. 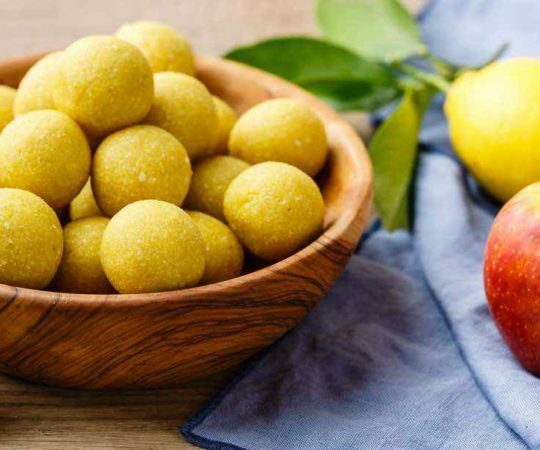 This mixture also loads each bite with fiber, antioxidants, and nutrients. 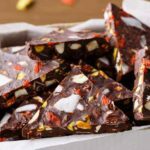 Like the other kinds of energy bites I have posted on PaleoGrubs, this recipe can also make energy bars if you press the dough into a square baking pan and chill in the refrigerator. 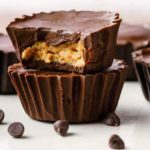 It really depends how you would like to consume the raw pumpkin pie snack – as a couple bites of dessert after dinner, or as bars for packing along on a trip. Whichever shape they take, they will be bursting with the deliciously sweet spicy flavors of pumpkin pie. oh em gee, I freakin’ LOVE pumpkin!!! I can’t wait to make this! Thanks so much for sharing! Sounds absolutely amazing. I need to find dates! Is it only nuts you are trying to avoid? 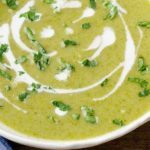 I ask because you may substitute with a seed such as sunflower, chia, or pumpkin seeds… I haven’t tried the substitution myself but it seems like it should work just fine. Otherwise, (breaking the paleo-ism of it all) you could always use oats. I agree with Michelle, if you are okay with a non-Paleo option, oats would probably be the best substitute. You would have to play around with the other ingredients to get a good consistency. 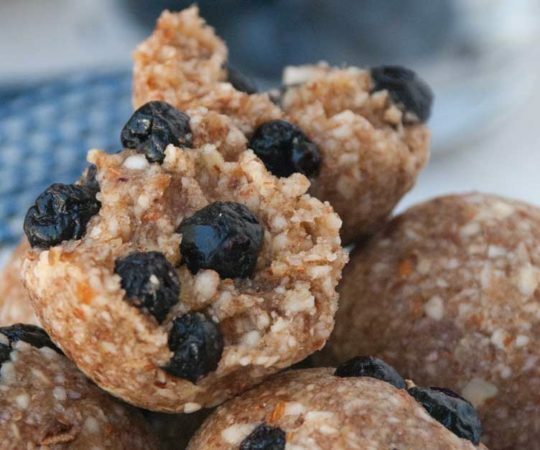 ground flax or oatmeal may work and how about raisins if you don’t have dates. Recipes are only suggestions if you use your imagination. Can’t wait to try these for Thanksgiving! Thanks for sharing! would shredded coconut be the same as flakes? Hi Kim – yes shredded coconut would work the same. Have you made them without the date paste? 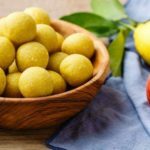 I avoid sugars as I have to do a modified FODMAPS. Any ideas? The only thing that came to mind was dried cherries, though that would change the flavor a bit. Someone else suggested persimmons which might be worth a try. I made these today, and they are delicious, but the texture is very soft. I did get them to form into balls, but they are really soft and hard to handle. Any ideas on what I might have done wrong? 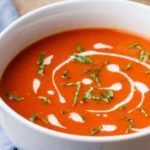 If the texture is soft, try refrigerating or even freezing them for longer. Do you think this would it work if you omit the coconut entirely? I’m newly exploring paleo, and am on day 20 of the whole30, I can do coconut flour and milks and such, but I can’t quite get past the texture of the actual coconut. Thanks! Hi Jen! Since everything is blended you actually don’t get the texture of the coconut flakes specifically. So if you like the taste of coconut I would suggest keeping it in! These are delicious, but mine are much darker in color, probably because of the dates. Also, they are quite wet and soft but firm up after a day or two in the fridge. How did you get the nice, golden color? Hi Eva, I’m actually not sure how the colors would differ, mine turned out that way following the recipe. Thanks for the wonderful suggestions Sarah! What could u sub for the dates? I have not tried making the recipe without dates. Figs or raisins might be suitable. We have nut allergies in our house – anything we could substitute? Thanks! 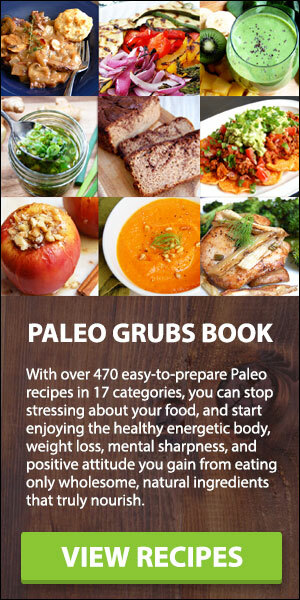 If you cannot have nuts, I would suggest oats (although oats are not Paleo, they are still healthy). I am also interested in a substitute for the nuts and coconut. My house is also completely nut free. Instead of coconut, shredded carrots would work well. Though I have not tried making this recipe without nuts, I think that oats would be a fine replacement. 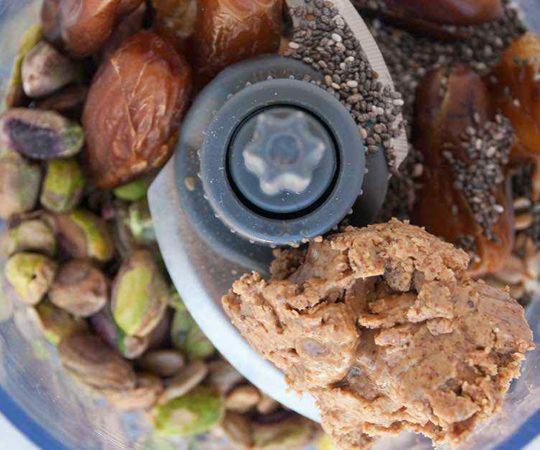 Could you use cookie butter instead of nuts or coconut insyead to give the consistency needed? These are delicious!! I am having a hard time forming into balls after chilling for over 30 minutes in the fridge. I stuck the puree into the freezer to chill longer. Any suggestions? If the puree is too soft, placing it in the freezer to chill would be my suggestion. Or you could add more coconut flakes. These look awesome and I happen to have all the ingredients on hand…so, tonight it is!! Great, hope that you enjoyed them! Anyhow, super easy, fast, and simple. The clove taste might be just a weeeee bit too strong (which is okay this time as I am a huge clove fan), but next time I might try knocking it down to 1/8 tsp. Thanks for the recommendation Michelle. Is there anything to sub for the dates? They seem to be really high in sugar. Hi Jennifer, I am not positive what would make the best substitution. I believe dried cherries or persimmons might be worth a try, as suggested above. Is there anything to sub for the dates? Those seem to be high in sugar. Is there any substitution for the dates? I love the idea but have three non-date eaters!! Someone above used persimmons in place of dates. Figs would be my second choice if not using dates. These came out amazing! Great snack!! Made these last night and let sit in fridge overnight. Ours came out too soft for our liking as well but the taste is great, the only thing I would change would be to use pumpkin pie spice mix instead of clove. The clove flavor is quite strong. Hey there- I also had a hard time getting them to firm up, but I am going to put them in the freezer and try them colder. I added a 1/4 cup of shredded carrots to the mix, and two scoops of banana whey protein and they are really yummy, even if they are a bit soft. I’m not paleo, but just eating clean. Thanks for the recipe! Hello! 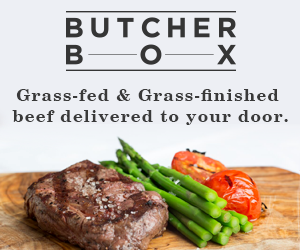 This looks great- do you think they would keep well in the freezer? My husband loves these and is traveling a bit for work. He wants me to send him some…do they have to be refrigerated? Or is that just for a better taste? If they do, could they be baked for a bit to make them safe to ship? Thanks for the recipe! I can’t figure it out …. RAW or COOKED pumpkin? 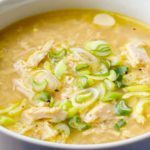 Is there any way to add eggs (or tapioca flour, perhaps?) to this and make it a baked recipe? It sounds like its got some serious pumpkin-flavored brownie-like potential!!! I just made these and gave a we taste to my two year old. “Those make me dance!” He said. After hearing that, the six year old wanted a taste and sure enough, she danced too. These taste good but mine turned out brown and are very mushy. I will leave the in the refrigerator for that but I’m curious why I didn’t get the nice golden color either. I made these today and they turned out perfect…TOO good because they will NOT make it until Thanksgiving! My food processor did not want to chop the dates very well. I was in a hurry so I just used them as it was. Mine chilled and formed balls perfectly. I put the dough into a glass bowl and covered it in the fridge for about an hour before forming. When I bite one and close my eyes it feels like I am eating pumpkin pie! But I think the flavor is better! They are seriously addicting. I have to be careful and limit myself. KEEPER for sure. I think all the spices are spot on. These are wonderful…like the flavor && texture…. Great little snack …love the flavors. I subsitued crushed pretzels for the nuts (only because I didn’t have them on hand). It worked for me. Next time I will try using oaks. These look awesome. I love pumpkin and dates!!! I tend to always crave sweets after a meal as well so these will be great. Thank you for sharing. I found the pumpkin puree really needed to be reduced in order for them to be firm enough to form balls. I tried it with canned pumpkin too, but still should have reduced the puree. Next time I will add the chia seeds and see if that firms them up better. But they are delish! These are great! I will definitely make these again. Mine were also more brown than orange and a little soft but still great! I’m thinking I should squeeze the liquid out of the dates a little more. Thanks for sharing! Does it take away (benefits) if I sub raisins for dates & toast coconut? I only have golden zahdi dates. Will that make a difference? These also work really well if made with about 2/3 c of sweet potato puree. 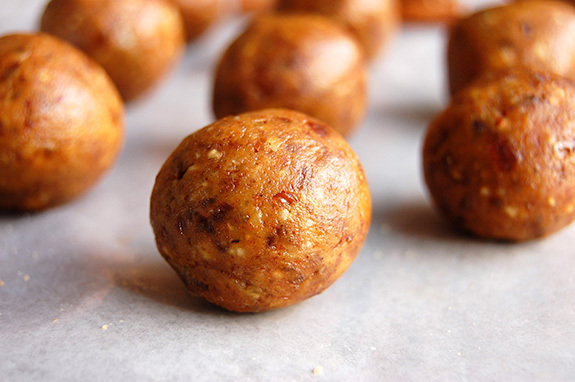 I’m having a heckuva time finding a recipe for Energy Bites or Balls that don’t contain any sort of nuts, seeds or nut butters (coconut is fine). This is the closest one I’ve found. Any thoughts on a non-nut/seed substitute for the pecans? I don’t care about texture so much as I want them to firm up. Doing a Ragnar in a couple of weeks and need some good energy food. 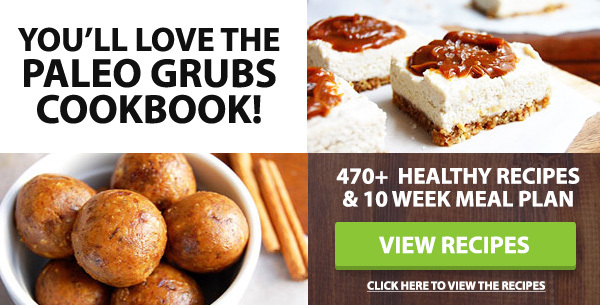 Just made these… they are good! I omitted the pecans, and added a little extra pumpkin so that the date flavor wasn’t too strong. They were quite soft even after keeping them in the freezer a little and then refrigerating for 24 hours. And the texture wasn’t that enjoyable to eat. So I baked them in the oven at 350 for 25 minutes and they are much better, in my opinion! 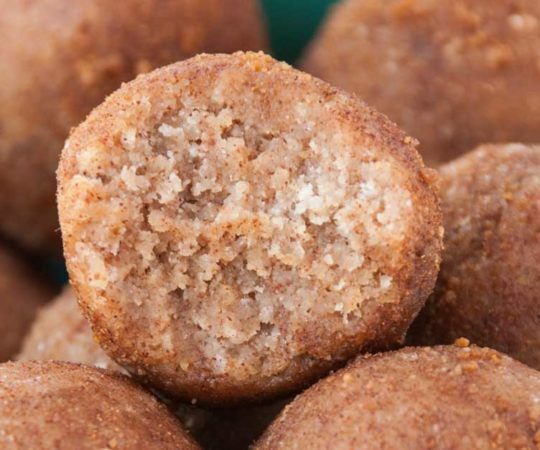 Has more of a “hushpuppy” texture and is easier (and cleaner) to pack in a baggie for a snack. Thanks for the recipe, Rebecca! I made these this week! so delicious. I had sweetened (“angel flake”) coconut so I used that instead of unsweetened. It adds 10 grams of sugar to the whole batch so I’m ok with that. 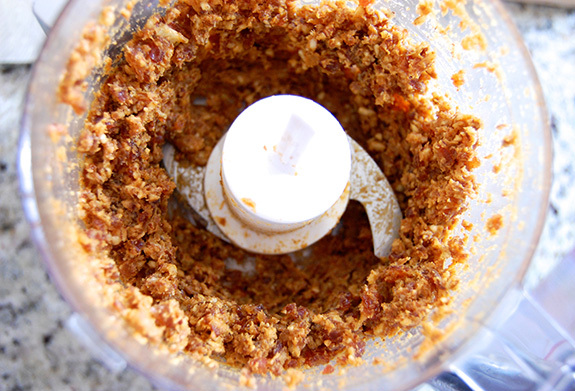 also, my food processor did not whirl the dates very well so on the second batch, I chopped the nuts and dates instead. It made a chunkier texture that requires some very satisfying chewing. So glad I tried it! These are over the moon! I rolled them in some more coconut flakes to make them easier to handle and served them for Thanksgiving! The family loved them and everyone wanted the recipe. So I emailed them the link. You have a winner here! 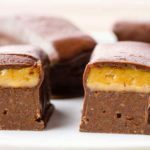 I made these as a sweet treat as my husband and I have ditched processed sugar. They are an instant favourite! Our teenaged son and his friends loved them too. We store them in the freezer and eat them frozen, so good! Thanks for sharing the recipe. I hadn’t thought of freezing them! I’m about to make these to tonight and will try them frozen. Thanks for the great idea. I have been making these since 2014 and they have become a favorite my elderly mom lives them. My hubby says he “dosent care for them that much,” but I find him sneaking them anyway. I took them to a holiday potluck (made two batches and was glad I did) and not only were they all eaten, but they stirred much conversation and earned second place (by applause) for “desserts” at the party! How long do you think these would keep in the fridge? Thanks! You said these were raw, but you aren’t actually using raw pumpkin, are you? Is the pumpkin puree cooked? 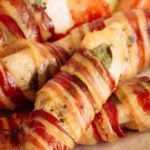 Any substitute for pecans? Tree nut allergy in the house. Would peanuts work? 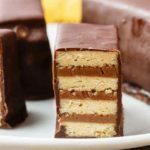 I started my paleo journey about two years ago, and this was my first sweet recipe that I tried. I absolutely love them. I’ve made them many times and I never get tired of them. I didn’t comment before but I made a batch tonight and I did something different before I made the bites. 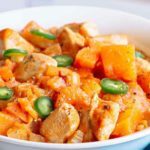 I was craving sweet potatoes, so I steamed a couple in my instant pot. I cut open the hot sweet potato and it occurred to me that maybe a spoonful of the pumpkin pie mixture might taste good with the potato. I spread about a tablespoon of it on the hot sweet potato, sprinkled some chia seeds and a little more cinnamon and it was amazing. Like pumpkin pie in a ball! I added raisins and oats for added sweetness and texture. A family favorite!